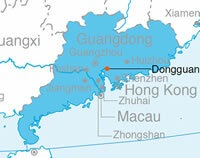 Dongguan is located north of Shenzhen and south of Guangzhou in the Guangdong Province, encompassing an area of 2465 km2. Due to the Reform and Opening Up Policy 1978 and Dongguan's strategic geographic advantages, the former small fishing village has seen the emergence of more than 10,000 enterprises and transformed into a major destination for foreign investment. Minimum wage: Dongguan is a class B city. On the 1st of May 2013, the city’s minimum wage rose to RMB 1,310 a month and RMB 12.5 per hour. There is no airport in Dongguan itself. However, there are five different airports within a three hour driving distance from the city, namely Guangzhou Baiyun International Airport, Shenzhen Bao’an International Airport, Hong Kong Airport, Zhuhai Airport and Foshan airport. Humen Port is the city’s main port. The port is an important gateway to the South of China as from there it is relatively easy to reach Guangxi, as well as the east, north and west parts of Guangdong. Humen Port, which is only two hours' drive away from Hong Kong's container dock, has daily ships going between the two places. Moreover, Guangzhou Huangpu Port, Xinsha Port, Shenzhen Yantian Port and the Shekou container dock are all only one hour’s drive away, and the port is only two hours’ drive from Hong Kong’s container dock. The city is at the center of the Guangzhou-Hong Kong Economic Corridor and is the meeting point of the Bejing-Guangzhou, Guangzhou-Kowloon, Guangzhou-Shenzhen, Guangzhou-Meizhou-Shantou and the greater Beijing-Kowloon railways. Furthermore, from 2013 to 2015, 17 intercity railway projects are expected to cover all 9 Pearl River Delta cities. In 2030, it is planned that there will be 21 lines, connecting most cities within the Pearl River Delta region. A well-developed highway system comprises the 107 national highway, Guangdong-Shenzhen highway, and Dongguan-Shenzhen highway. With computer parts manufacturing and information technology as its core, the city’s industrial sector focuses on electric equipment and machinery, electrical appliances, textiles and garments, furniture, toy manufacturing, food processing, paper making and chemical products. In 2010, approximately 20 percent of all computers worldwide were made in Dongguan. Dongguan is home to the largest mall in the world (based on gross leasable area), which has remained largely vacant since its opening in 2005. This will be part of a wider effort to upgrade the city into an important international-level manufacturing center by 2015. Specifically, the added-value of advanced manufacturing industries in the city will be over 50 percent of the total local industrial added-value by that time. Key regional zones and most important industries and its location within the city. The city has formed an advanced and comprehensive manufacturing system that covers more than 60,000 types of products across 30 different industries, and almost every one of Dongguan’s individual towns has its own unique and well-known industrial expertise. In total, Dongguan consists of 180 industry and economic districts, among which over 30 are considered to be large. Dongguan’s main development zone is the Dongguan Songshan Lake National High-Tech Industrial Development Zone. In 2001, this zone was approved by the Provincial People’s Government. The zone was upgraded by the State Council to be a national-level High-Tech Industrial Zone in 2010. The zone consists of the northern, eastern, central and lakeside districts. The northern district mainly consists of headquarters, high-tech companies, and research and development companies. The eastern district mainly consists of Taiwan-invested high-tech and research and development projects. The central district is highly focused on research and development and education. The lakeside district is mainly a tourism area but is also a location for research and development projects and headquarters.